Check UNIMED 2017/2018 Post-UTME Screening Result. I will be showing you how to go about the whole thing but before then, UNIMED hereby informs all candidates who participated in the admission screening exercise that the 2017/2018 Post-UTME Screening Results is out and you can check it by yourself. * Fill in your JAMB Registration Number and Password in the spaces provided. * Click on login to check your Post-UTME UNIMED screening result. 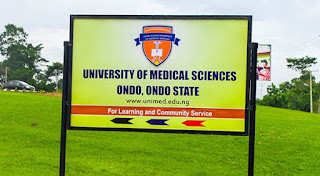 Candidates seeking admission into UNIMED should note that the University name is inadvertently written as “ONDO STATE UNIVERSITY OF MEDICAL SCIENCES, ONDO” in the current JAMB Brochure says the management of the University. The general public should take note of the recent changes so as to avoid errors during jambs registration.